So we’re on families Thanksgiving vacation and I’ve have finally finished the first draft manuscript of the 40 plays in 40 days experience. (Interesting that the last 1/2 of the plays took almost 2 years to write…or make the time to write). Anyway, so my next steps are to do a re-through and fill in certain gaps that I’ve noted when I wrote the first draft and then start pitching the thing to places that like to print stuff. So far I’ve got ~85k words which sounds like a reasonable length for reading. (Editing might whittle that word count down). When I get information, I will post it here. I had a chance to sit down with a newer podcast called Theatre Geeks and explain myself, my summer and why I think Shakespeare is still okay for community theatre. Whereas my last interview with RSC was more of an overview of the entire summer, I got a chance to discuss with Dave and Marcia and John some of the more pointed questions that sometimes centered around “Why?” If you like theatre and especially the idea of community theatre, these are three people who have some things to say and ask. Thanks to Dave for inviting me, to Marcia for not allowing me to call her “Ma’am” and to John for the hospitality of using his home for the recording (he claims he didn’t say much during the taping). Good people and check out their site and their podcast. You Can’t Get Enough Shakespeare? This summer of 40 plays in 40 days reminded me again of the wonderful people out there in the States who produce quality Shakespearean performances in a wide-variety of venues. Many of the performances had some type of announcement (or plea) regarding donations and how difficult it was to keep providing these quality performances in an economy that was demanding us to consider our most basic needs of shelter and food and work. I am fortunate though: I have been teaching in the same school district for 15 years, have a steady income and have a wonderful wife who also had steady work and income throughout this year. So, why shouldn’t we give back to the arts? One of my rules during this summer was to always give a donation at any performance that asked for one. I did this not so much out of guilt, but out of obligation: I should “earn my keep” and after a performance the least I could do was drop some money in the basket before I was off to another venue. Now, as the end of 2009 draws quickly to an end and as we consider those last moment donations, it seems only reasonable to give back to those same companies and troupes that gave me another play to experience in my journey this summer. Some folks give to their places of worship in a variety of venues: churches, museums, causes, politics, etc. And this year has had us give to all of those places and as I consider the end of this year, I gave today to three of the venues from the summer. Why? Because I could and I should. From those who were the opening act of the summer (Harrisburg Shakespeare Festival with Cymbeline) to the only venue in the state which I live (Greenwood Shakespeare Festival with Love’s Labours Lost) to the beginning stage of a Mid-America swing (Nebraska Shakespeare Festival in Omaha with a cool production of Macbeth): to those I gave today. It wasn’t an extraordinary amount of cash, but just a little ongoing investment we can make in the arts and for my cause: companies who share Shakespeare with their communities. It really is about that silly cliche: It is better to give than to receive. For me, this summer, I received so much from all of the companies I visited and those who even helped in the readings. To give feels good and that’s not a bad way to close out 2009. What high school English teacher wouldn’t show the Reduced Shakespeare Company’s (RSC) Complete Works of Shakespeare–Abridged? And so I have (usually after hanging out with Hamlet for a couple of weeks) for my AP English Literature and AP English Language classes. It is simply classic deconstruction of the Bard’s works and in the end, we the audience are better for it. For me, the RSC’ reminds us to not take ourselves too seriously, nor that thing we call “scholarly” talk. Instead, we are whipped through all the works in less than 90 minutes and by the end, we have experienced the range of Shakespeare’s works. Some call it classical works for a short-attentioned audience; my sons just think it’s plain funny. So, we surprised Colin and Evan by making the 4 1/2 trek to Madison, WI and saw Austin and Matt and Mick perform the “revised” version of the abridgment and I got a chance to share with Austin afterward how the RSC was part of my inspiration for last summer’s “40 Plays in 40 Days” project. Most folks who follow the RSC know of their quality podcast and I bent Austin’s ear (and iPod) and got explain my project and its impact. You can hear the podcast here: Episode 158: 40 in 40. (Thanks Austin for listening and posting the interview). The summer experience of seeing all of Shakespeare’s plays is long over (since the end of August), now what? I’m currently finishing the write-ups for the rest of the summer plays. I haven’t been posting those “stories” of the plays on the site here as my priority is to get them written first and at least do a read through or two. I have been bringing these “days of 40plays” to my writing group and they seem to agree with me: the experience is somewhat interesting and the writing isn’t bad. So, and I think I’ve alluded to this in the past, I’d like to try one or two these write-ups on a wider audience and if that seems to go in a positive direction, pitch the whole she-bang as a book. Aside from delusions of aspirations, I am looking to present at our state reading association regarding Shakespeare in the classroom (and how we can save the bard from the damage we as English teachers have done to some pretty good plays). I’ll be sure to post any of the writing or resources on this site. Beyond that, I would like to continue spreading the word of Shakespeare and of the arts and of the incredibly talents troupes who serve their communities by providing quality Shakespearean performances year in and year out. Kudos to you folk, really. Until my next post, we’re surprising the boys next weekend. More about that later. As part of my documentation of my grant from the Lilly Endowment Foundation, I was invited to share my summer experience at a dinner last month with fellow grant recipients (we had a 3-minute limit…yikes!). Also, we are required to give an initial accounting of our summer experience and then next June, we are to give a final report. My project began when we packed up the car and headed toward Lancaster County, Pennsylvania the day after the end of the school year and ended in Buffalo, New York the Saturday before I was to be back at school. After staying in 21 hotel rooms, attending 29 different venues, flying to the West coast twice, and driving 14,028 miles, I did it: I saw all 38 plays of William Shakespeare…well, sort of. Even during the planning stage the three months leading up to the trip to Pennsylvania, the thought stuck me: Once I’ve done it, it’s over. And I remember being a bit sad as I was beginning the journey back June because I realized that as journeys begin, they also end. Little would I realize how intense those last three weeks would be. Also, as I was trying to project seeing that last play, I imagined how I might cry and how my family would hold up banners to welcome me home and how the media would be there to record this historic feat. No, I merely smiled after the death of Brutus and the last speech by Octavius, walked to my car and drove back home to Goshen, Indiana. The journey over, but the reflection and impact would continue on. So I did accomplish my initial goal (to see all of Shakespeare’s plays) in a way. I knew in the planning of this trip that to actually “see” live performances of other people acting out the plays probably wouldn’t happen. In fact at one point in March, I thought I might just stick with the 31 performances that I had put on my schedule. But I figured if I could get this far, 31, why couldn’t I find a way to get all 38 plays? Then I got the idea of conducting public readings; that the reading of the seven plays would fulfill–at least in my mind–the “seeing” of the plays. I recruited my family to read “Timon of Athens” on family vacation, had my sons read “Two Noble Kinsmen” on a Tuesday and then have friends come over and do a marathon reading of “Henry VI parts 1, 2, and 3” — three history plays– in one day during the last week of the summer. I was also able to read “Henry IV Part 2″ with friends in Portland, Oregon and read “King John” with friends of a friend in Orange Pond, New Hampshire. I saw all of the William Shakespeare’s plays in one summer; something that is as unusual as running a marathon in every state or walking the entire Appalachian Trail or visiting every Major League Baseball stadium. So I was able to accomplish my little stunt as a result of receiving this Teacher Creativity grant and I will probably never get a chance like it again: it’s unique and a bit crazy and it’s my experience. Or at least that’s what I thought (something I’ll touch on a little later). My other goal in the project was to see how accessible Shakespeare is in the States, or, as sometimes people may say “It’s just too difficult to appreciate.” The answer is that yes, Shakespeare translates very well to a wide-variety of audiences across the US. From a viewing of “Cymbeline” in a park in Harrisburg, to an intense “third-world coup” themed “King Lear” in Washington DC, each performance was a reflection of each of the communities. What I mean is that “Merry Wives of Windsor” in a park in Kansas City, Missouri was a performance by and for that particular community and people had a good time. The dramatic entrance of the entire cast of “Pericles” up the side of a hill overlooking the Hudson River in New York was particular to the community of that area. And even my readings of various plays carried a certain magic that was particular to the people and the place and the time of the reading. Art does that to us and I know I shouldn’t have been surprised, but this summer had many moments of loving the language and characters and stories of Shakespeare–not so much because I particularly love Shakespeare, but because I am human and his stories and character were also very human and I got caught up in the drama of the plays. Art really does imitate life, you know? What surprised me the most about this experience is that I had originally framed it as “my thing” or “my summer” and I didn’t expect the impact of my experiences would have on my family and especially my two sons. I remember feeling as though I had to make accommodations for Evan and Colin when we went to see “The Two Gentlemen of Verona” in White Bear, Minnesota. Instead, as the company performed for their community in this smaller outside venue, the magic of drama and humanity of Shakespeare touched my sons and they had a wonderful time. 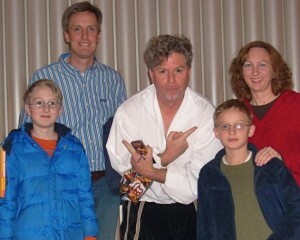 And from that point on, the youngest son–Colin– would talk nothing else but what play I was seeing next or his favorite part of a play he had seen with me. 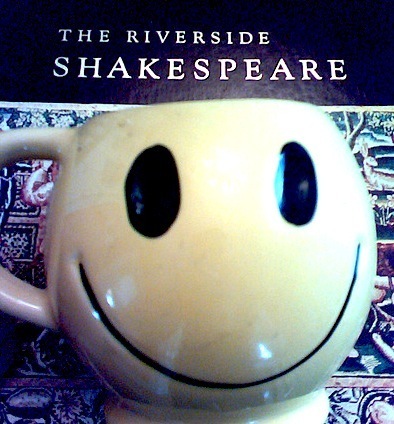 In fact I had to buy him his own Riverside Shakespeare ( a heavy tome of a book) so he could have his own to read through the plays. I know that when I go home tonight, he’ll be telling or asking me about something regarding “Richard III” or “Hamlet” or “Macbeth” or “Julius Caesar” because Colin got to see what I saw this summer: 400-year old plays and characters that still translate over to today’s world. It’s the stuff dreams are made on, really. It took me around two weeks into the school year to shake off that combination of an experience much like that of Around the World in 80 Days meets The Amazing Race. The project reminded me of this idea of fluency and that instead of spending so much time on talking about a book or poem or story, time is better spent in merely reading and experiencing that book or poem or play. As I continue to teach a few of Shakespeare’s plays in my classes, I’ll still continue to emphasize the seeing of Shakespeare and de-emphasizing the filling in of blanks on a page that is geared to suggest only one way of knowing a play. For it is in the personal interaction with the primary text that one gets to create a frame of mind or a theater of the mind for those words and characters and situations to take place in. Next month, I plan on proposing a Shakespeare class at the school I teach at and my intent would be to spend a lot of time on fluency with his plays as opposed to learning about the plays. Also, I plan on finishing my write-ups documenting my summer experience by December and perhaps, would like to see if a book could come out of that writing. (Currently I am through Play 16 and my word count is about 31,000). It took me seven tries to get this grant and each time I really liked what I proposed. Perhaps it was my title this time or that I had written the grant in such a way that I would be spending a good chunk of summer doing the proposal. For me, I am grateful for being treated as a professional educator and having the trust put in me that I can develop an experience that would affect me as a person and as an educator. Am I still a bit giddy that I actually got the grant? Yes. Do I still smile at those times I was racing to the next performance only to be in awe of the play? Of course. My summer, the summer of 2009 was just plain cool and I am grateful for the Lilly Endowment Foundation for continuing their investment in what matters to many of us: a break from the pettiness of now and to refocus on the stuff of soul: renewal. The last Shakespeare play of the summer: number 38!